Discussion in 'Instagram' started by umpalapo, Apr 15, 2019. Just started botting the account using a freelancer one week ago. Did not buy any followers or likes. Should I be worried? Maybe your freelancer is buying followers ? Were you using any apps to manage instagram? I'm using later for scheduling and the freelancer is obviously using some kind of bot for F/UF. And people were trying to tell me I wrong wrong that it's against the TOS to buy followers or likes, HA! FYI - I'm not against it, but at least admit there's a chance you can get banned. This is why you should NEVER share your login information with anyone. This has nothing to do with using SMM Panels just to be clear. SMM Panels only need a public link, not your login info. 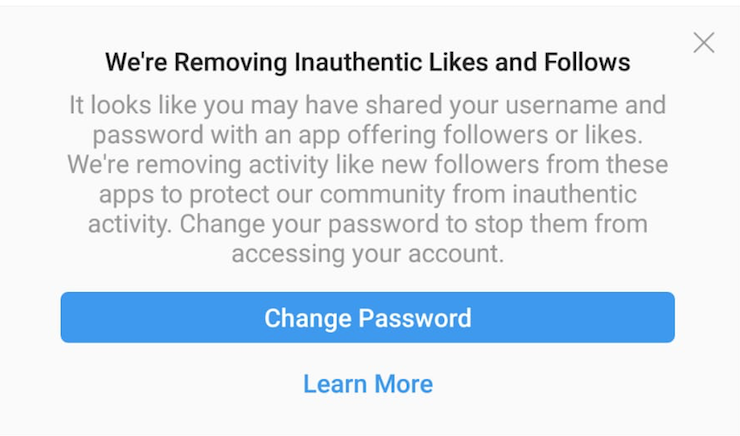 This is because you used a 3rd party software and entered your Instagram Login Information. You should never do that. Who told you it's not against the TOS? The terms of service clearly state you can't violate the community guidelines, which includes artificially collecting followers. This below involved SMM Panels. I just wanted to defend all SMM Panel owners so we were not raged with questions. I got this message too on some of my clients accounts. None of the accounts lost any followers or likes though. I deactivated one of the accounts on jarvee and hope this will solve the issue. Probably to many actions from one ip adress is what triggers it. Got it on one of my clients account too. I am using 3 accounts per proxy. SMM Panels provide followers/likes etc from the apps like Followers++ and those where you earn points for following. App owners have deal with SMM Panel owners and it goes all around. So yes, your account can loose followers because of SMM Panels, but no, it can't be banned because of that, just your engagement rate will go down if you use panels for this purpose! I'm talking about natural engagement. All of those things that SMM Panel provides are bad for natural growth, call it, kill for natural growth. So when you buy followers, likes etc, you should just do it for fake brand awareness, nothing else. And you can't prove me wrong since I think I know better about Instagram than you do base on your posts. Peace. You were stating that buying engagement from SMM Panels will make your engagement growth go down, but that is false. It only makes your engagement go down if you do not buy other services. Meaning, if you buy 10k followers, you should also buy likes, comments, etc. to keep a healthy engagement ratio. I think I know better about Instagram than you do base on your posts. Peace. Okay, won't argue at all, just to let members of this forum know that things that you said above are 100% false. Buying fake comments, likes & followers will kill your growth. Why? Once you publish your post, Algorithm shows it to the first ?% (let's say 10%) of your followers, if they liked it, then the algo will show your posts to more of your followers in the newsfeed and promote you to explore page. If you buy fake followers you know what will happen... So, just don't buy if you want to grow and don't listen to people like person above. Do you work at IG ? Ok... I thought so, nobody know. I don't think IG works this way. BTW, if those "FAKE" followers are bots, they will most probebly like thier feed - > more chance then normal ppl to like you post. Buying SMM from SMM Panels only benefits your social image. Especially when 100% will drop!